RÉSONAANCES: Dark matter signal in Fermi? Interesting post. About the plot, how is the invariant mass calculated, with any pairs of detected photon ? Thanks. No, the plot shows the energy of *single* photons as measured by Fermi, not the invariant mass of photon pairs. In this case the quantization of the photon energy is (supposedly) due to 2-to-2 kinematics of dark matter annihilation at rest. Dark matter constitutes at least 20% of all matter. Therefore, it should not be like looking for the proverbial needle in a haystack. Here we have yet another "mystery bump", which are so popular in particle physics these days. The author admits that it will probably take a few years to get the uncertainty down to the point where we can know what, if anything, we are dealing with. The Fermi team has virtually ruled out the most likely "WIMP" candidates. Dare we consider the possibility that the dark matter is not in the form of any kind of subatomic particle? Or do we chase the equivalent of unicorns forever? I forgot to mention my own most likely candidate for the galatic dark matter. It is not enough to criticize; one must also offer a credible alternative. I believe that the galactic dark matter is primarily in the form of primordial black holes, and microlensing observations support that possibility. The trillions of unbound planetary-mass "nomad" objects discovered in the last year may be the low-end tail of the PBH mass function. The main questions regarding PBHs are their abundance and their mass function. Microlensing observations are in the process of sorting this out. 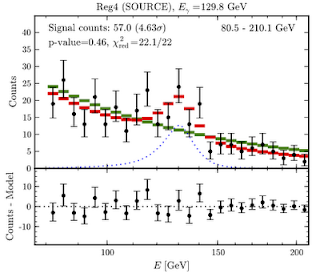 But i cannot understand why the error bars are smaller for E>150 GeV and larger below. It seems that the peak position is just near the error bar size transition. Aren't they smaller just because the event count is smaller? (assuming the errors are statistics dominated, not 100% sure about it but their sizes roughly look like sqrt n). 7 are roughly +1 sigma and 9 are roughly -1 sigma. I cannot find events in the +/- 0.5 sigma range, probability of this fact is small. Above 150 GeV i found a normal behavior. 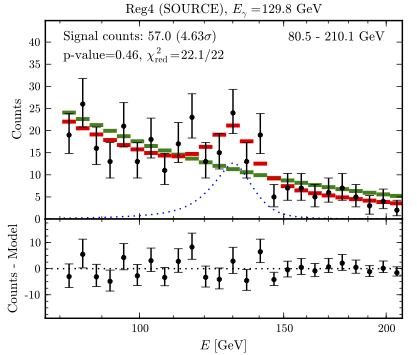 Maybe errors below 150 GeV are underestimated in this plot, however other plots of the same paper have better distributions. Did you see the latest paper by Juan Collar? I'm afraid Juan has already used up all his credit points.